Aqua Allegoria Flora Cherrysia is a new perfume by Guerlain for women and was released in 2019. The scent is floral-fresh. It is being marketed by LVMH. 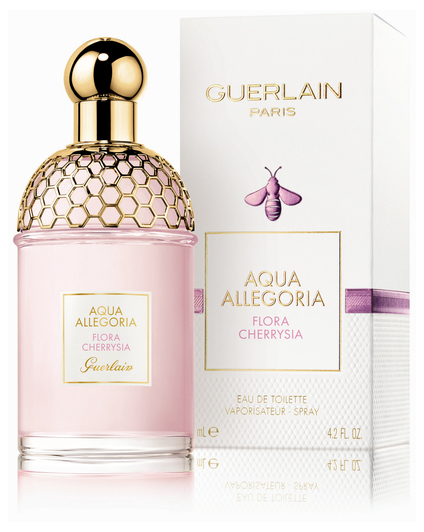 Hello snoopers and welcome to a new comment from me today describing one of Guerlain's new Aqua Allegoria fragrances, Flora Cherrysia, to be exact. You may know that I generally think a lot of this series, because they are mostly loose, beautiful good mood fragrances, with whose variety there should be something for every taste! The fragrance begins wonderfully fruity fresh with floral notes. At first I smell a delicious smelling watermelon, which together with bergamot and pear smells very nice and conveys a wonderfully relaxed spring feeling. In addition, the cherry is added and adds another fruity note to the fruit. But don't worry, if you are afraid that everything could smell so squeaky, colourful and fruity now, because I think that the fruity scents are really perfumed. A little later, the fragrance remains fruity and fresh, but now also gets more floral scents. It may be that I smell cherry blossoms here, because I generally perceive a cherry scent (but I am not so sure whether these come from cherries or from the cherry blossoms). And I'd rather not ask if cherry blossoms also smell like cherries... :DD). In addition I smell general (white) flowers as well as violets, which are however somewhat weakly turned out, nevertheless one can smell their sweetish powdery smell out nevertheless. If the fruity notes are still clearly in the foreground at the beginning, they become weaker over time, so that in the base the floral scents are slightly stronger than the fruity ones. In addition, there are woody notes which, together with the flowers, give a somewhat "dry" impression, but the scent remains generally beautiful, even if the cherry that gives the name is harder to smell towards the end. Musk sweetens the scent a little towards the end. Oh and the scent has a slightly clean note, which almost smells soapy, which could perhaps be due to the musk just mentioned, since musk does not come across soapy, but clean from time to time. The Sillage is mediocre to weak, which is a bit unfortunate, because you won't smell the scent very well with others (so you have to get closer), but you know this from most summer scents as well as from the Aqua Allegoria scent series in general. The shelf life is also medium with about five to six hours. The bottle is cylindrical and has a domed top. A gilded honeycomb dress was attached to this dome, which looks very nice as always. In addition, the bottle is further enhanced by the pretty pink fragrance liquid. The lid is round and also gold-plated. All in all, the bottle is of the usual high quality, lies well in the hand and simply looks great. Soo... yeah, that was one of the new Aqua Allegorias. I liked it a lot. Even if the fragrance wasn't really something special, I liked it already. Yeah, I'd like to smell that scent on a lady. I may not have a girlfriend at the moment, but I can only recommend it to you ladies to try it out or even use it to please your surroundings, even if the scent here is strictly speaking not a world novelty and "only" above average. Cause I'm sure he smells nice on you! Yes, that's right. It's not a fragrance that you'd miss painfully if you were to hire it. But you certainly don't make the mistake of using it every now and then on nice spring and summer days, especially when it's in your spare time, or as a loose and unobtrusive scent at work or just for yourself. And as described, I stress again that I think that the fragrance, despite many fruity notes, is not somehow garly shrill and colorful, but rather beautiful feminine. ...awakens the Japanese woman in you! This is a short comment. Not because the fragrance is so meaningless, but...well, the typical aquaallegoria durability and general performance. As a "nose" I am more spoiled, so a "smellability" of about 3 hours does not really satisfy me. But these 3 hours the scent is: beautiful! And if I were Japanese, and not Original German with shoe size 42 and just Brachialduftliebhaberin, I would shyly smile and with almond-eyed eyes look at this fragrance love and me at its fresh, innocent aura refresh, while I on tiny shoe size 35 feet through the cherry blossom forest tippeln. In the lightning test he had with me the 1st place of the 3 new Aqua Allegorias, but in the long run he might not be able to hold it. The light Nashi pear sweetness is the only source of sugar, and it is so light and fruity that one cannot speak of gourmandig. Rather, the fragrance is fresh and flowery, with spring-like green sprinklings. So sweet, so shy, so well-educated. Write the first Review for Aqua Allegoria Flora Cherrysia!